For all 1290 related mods. I'm finally getting to the point of wanting to drop a tooth on the front sprocket. Only 6,000 miles on the bike, so no chain/sprocket set needed yet. What is your preferred manufacture of the front sprocket? I'm assuming that it is a 16T 525. I bought a 16T but never fitted it. On most tracks it has so much torque you just grunt through it. I might try it when i swap chain but that is a fair few miles off on my 2017. I could maybe see more of reason to swap on the roads though. I agree with Klink, there is so much torque that on the smaller tracks I rarely need to shift. I guess on the street it would make 6th more useable? 2015 SDR, loving every minute! I switched to a 16 tooth mainly so that I could use 6th more often on the freeway (at sub 100mph speeds) as well as using 3rd more in the mountains when I'm riding instead of 2nd. Still pulls like a freight train, and I'm getting used to the gearing..
one word of advice- get the KTM OE front sprockets. they have an integral rubber damper/bumper system that's built into the sprocket. Not sure what exactly it does (could just be a noise thing) but the OE sprockets have a larger rubber section in the middle. I've used the 16 and 17 tooth on my 950 and the 1290, same sprockets. 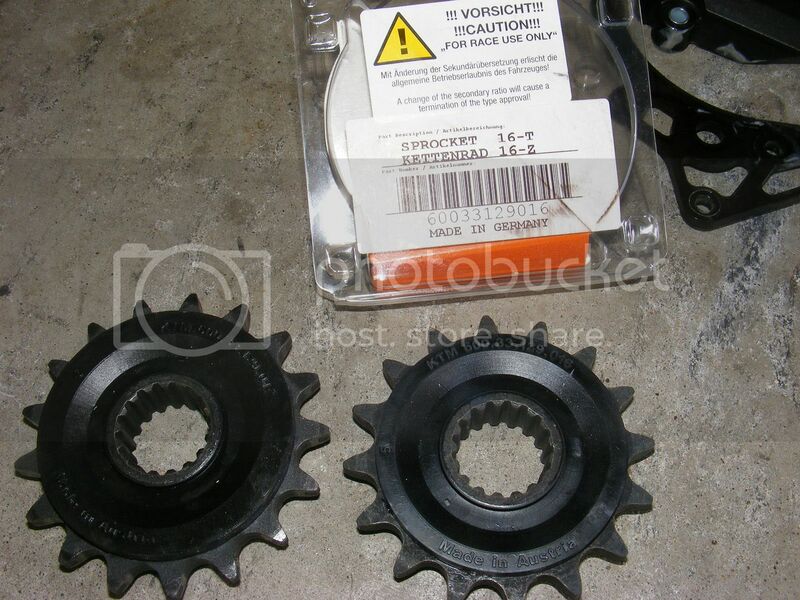 Both wear the same OE sprockets. Not that expensive. $44 at KTM World and free shipping. you can't have too much Super in your life, right? 2007 950 Super Enduro- too much to list..
SpeedyR wrote: I switched to a 16 tooth mainly so that I could use 6th more often on the freeway (at sub 100mph speeds) as well as using 3rd more in the mountains when I'm riding instead of 2nd. Still pulls like a freight train, and I'm getting used to the gearing.. Thanks for the heads up. Factory is the way to go then. I feel the gearing change will aid in highway, and track use. I met with some KTM factory pros that were involved in the Pikes Peak run. Can't recall their names. They said the first mod you should do is to drop the front one tooth, and that is done on all their bikes. But, we didn't get into "which brand". I guess they just assumed factory. I didn;t even know there was a factory one. I did this mod and immediately felt an annoying high rpm vibration. Mostly on the foot pegs but some through the handle bars. I went back to the stock sprocket and problem went away. I did notice a little bit more torque but not enough to live with the additional vibrations. silverr1 wrote: I did this mod and immediately felt an annoying high rpm vibration. Mostly on the foot pegs but some through the handle bars. I went back to the stock sprocket and problem went away. I did notice a little bit more torque but not enough to live with the additional vibrations. Sorry you had that experience. I installed the factory 16T that is "dampened". I feel nothing different in the rear sets. Although I have Bonamichi rear sets, so they give a pretty solid feel overall. However, with that, the Cat-Delete, and the Akrapovic Re-Flash, the throttle is super touchy. The beast is in full "beast mode". I've had various counter-shaft sprockets and it's definitely the non-damped that causes the vibration. Currently running a 16 tooth (damped) from JT Sprockets. They also do a damped 17 tooth and the rear 38.